2052. Ahart, M., R. E. Cohen, and R. J. Hemley, Pressure-induced transitions in ferroelectric single-crystal PbZr0.54Ti0.46O3, Bull. Am. Phys. Soc. (APS March Meeting) (Denver, CO, March 3-7, 2014). 2051. Butch, N. P., J. Jeffries, P. Syers, J. Paglione, Y. Xiao, and P. Chow, Valence and moment of Sm in SmB6 under pressure, Bull. Am. Phys. Soc. (APS March Meeting) (Denver, CO, March 3-7, 2014). 2050. Cahill, D., J. Huang, W. Wang, and C. Murphy, Resonant secondary light emission from plasmonic Au nanostructures at high electron temperatures created by pulsed laser excitation, Bull. Am. Phys. Soc. (APS March Meeting) (Denver, CO, March 3-7, 2014). 2049. Chen, J. Y., C. S. Yoo, M. Kim, H. P. Liermann, H. Cynn, Z. Jenei, and W. Evans, Solidification and fcc- to metastable hcp- phase transition in krypton under modulating dynamic pressures, Bull. Am. Phys. Soc. (APS March Meeting) (Denver, CO, March 3-7, 2014). 2048. Chen, X. J., Y. H. Zhou, J. J. Ying, T. Muramatsu, V. Struzhkin, H. K. Mao, Z. A. Xu, X. H. Chen, G. Y. Xu, and G. D. Gu, Iron-based superconductors under heavy compression after destruction of superconductivity, Bull. Am. Phys. Soc. (APS March Meeting) (Denver, CO, March 3-7, 2014). 2047. Cohen, R. E., I. I. Naumov, and R. J. Hemley, Optical signature of metallization of hydrogen, Bull. Am. Phys. Soc. (APS March Meeting) (Denver, CO, March 3-7, 2014). 2046. Driver, K., S. Zhang, B. Militzer, and R. E. Cohen, Quantum Monte Carlo simulations of a single iron impurity in MgO, Bull. Am. Phys. Soc. (APS March Meeting) (Denver, CO, March 3-7, 2014). 2045. Forouzani, N., J. Lim, J. Schilling, G. Fabbris, and Z. Fisk, High pressure study of electrical resistivity of CeB6 to 136 GPa, Bull. Am. Phys. Soc. (APS March Meeting) (Denver, CO, March 3-7, 2014). 2044. Jeffries, J., N. P. Butch, Y. K. Vohra, and S. T. Weir, Pressure evolution of electrical transport in the 3D topological insulator (Bi,Sb)2(Te,Se)3, Bull. Am. Phys. Soc. (APS March Meeting) (Denver, CO, March 3-7, 2014). 2043. Kaluarachchi, U., V. Taufour, M. A. Tanatar, S. K. Kim, Y. Liu, T. A. Lograsso, S. L. Bud'ko, P. C. Canfield, N. Foroozani, J. Lim, and J. Schilling, Pressure dependent resistivity and magnetic measurements on superconducting KFe2As2, Bull. Am. Phys. Soc. (APS March Meeting) (Denver, CO, March 3-7, 2014). 2042. Li, D., P. Zhao, N. Gunning, D. Johnson, J. C. Zhao, and D. Cahill, Measurement of surface acoustic wave velocity using phase shift mask and application on thin film of thermoelectric material, Bull. Am. Phys. Soc. (APS March Meeting) (Denver, CO, March 3-7, 2014). 2041. Lim, J., N. Forouzani, J. Schilling, R. Fotovat, C. Zheng, and R. Hoffmann, Hydrostatic high-pressure studies to 25 GPa on the model superconducting pnictide LaRu2P2, Bull. Am. Phys. Soc. (APS March Meeting) (Denver, CO, March 3-7, 2014). 2040. Lin, Y., R. E. Cohen, K. Driver, B. Militzer, L. Shulenburger, and J. Kim, Quantum Monte Carlo calculation for the equation of state of MgSiO3 perovskite at high pressures, Bull. Am. Phys. Soc. (APS March Meeting) (Denver, CO, March 3-7, 2014). 2039. Mandal, S., R. E. Cohen, and K. Haule, A DFT+DMFT investigation on electron-phonon coupling in FeSe, Bull. Am. Phys. Soc. (APS March Meeting) (Denver, CO, March 3-7, 2014). 2038. Muramatsu, T., V. Struzhkin, and L. Gasparov, Electrical resistivity study of Magnetite under high pressure, Bull. Am. Phys. Soc. (APS March Meeting) (Denver, CO, March 3-7, 2014). 2037. Naumov, I. I., R. E. Cohen, and R. J. Hemley, Graphene physics and insulator-metal transition in compressed hydrogen, Bull. Am. Phys. Soc. (APS March Meeting) (Denver, CO, March 3-7, 2014). 2036. Ogitsu, T., S. Hamel, A. Shamp, and E. Zurek, Phase diagram and Equation of State of Boron Carbide, Bull. Am. Phys. Soc. (APS March Meeting) (Denver, CO, March 3-7, 2014). 2035. O'Neal, K., T. Brinzaria, J. Wright, J. Musfeldt, S. Giri, Q. Wang, P. Jena, J. Schlueter, and Z. Liu, Pressure-induced magnetic crossover driven by hydrogen bonding in CuF2(H2O)2(3-chloropyridine), Bull. Am. Phys. Soc. (APS March Meeting) (Denver, CO, March 3-7, 2014). 2034. Pravica, M., D. Popov, S. Sinogeikin, D. Sneed, Q. Smith, and G. Guardala, X-ray induced mobility of molecular oxygen at extreme conditions, Bull. Am. Phys. Soc. (APS March Meeting) (Denver, CO, March 3-7, 2014). 2033. Tan, X., A. F. Goncharov, V. Struzhkin, and X. Chen, Study electron-phonon interactions under high pressures by ultrafast time-resolved spectroscopy, Bull. Am. Phys. Soc. (APS March Meeting) (Denver, CO, March 3-7, 2014). 2032. Wang, S., J. Zhang, X. J. Chen, V. Struzhkin, W. Tabis, N. Barisic, M. Chan, C. Dorow, X. Zhao, M. Greven, W. Mao, and T. Geballe, The strain derivatives of Tc in HgBa2CuO4+δ: CuO2 plane alone is not enough, Bull. Am. Phys. Soc. (APS March Meeting) (Denver, CO, March 3-7, 2014). 2031. Wang, X., N. Coates, R. Segalman, and D. Cahill, Lorenz number of conducting PEDOT:PSS, Bull. Am. Phys. Soc. (APS March Meeting) (Denver, CO, March 3-7, 2014). 2030. Wilson, R. and D. Cahill, Anisotropic deviations from Fourier's law in Si and MgO and the importance of temperature-profile extrema, Bull. Am. Phys. Soc. (APS March Meeting) (Denver, CO, March 3-7, 2014). 2029. Xi, X., C. Ma, Z. Liu, Z. Chen, W. Ku, H. Berger, C. Martin, D. B. Tanner, and G. L. Carr, Probing the pressure-induced topological phase transition in BiTeI, Bull. Am. Phys. Soc. (APS March Meeting) (Denver, CO, March 3-7, 2014). 2028. Zhang, P., R. E. Cohen, and K. Haule, Magnetic properties of FeO: a DFT+DMFT study, Bull. Am. Phys. Soc. (APS March Meeting) (Denver, CO, March 3-7, 2014). 2027. Zhao, Z., S. Wang, A. Oganov, P. Chen, H. Zhang, Z. Liu, and W. Mao, Pressure-induced insulator to metal transitions in potential 3D topological insulators Ag2Se and Ag2Te, Bull. Am. Phys. Soc. (APS March Meeting) (Denver, CO, March 3-7, 2014). 2026. Zhuravlev, K., A. F. Goncharov, S. Tkachev, P. Dera, and V. Prakapenka, P-V-T equation of state of SiC-3C: implications for primary pressure scale, Bull. Am. Phys. Soc. (APS March Meeting) (Denver, CO, March 3-7, 2014). 2025. Yoo, C. S., Novel material design and discovery at extreme conditions, Colloquium at the Department of Chemistry, Eastern Washington University (Cheney, WA, November 6, 2014). 2024. Yoo, C. S., High energy density solids: Novel materials design and discovery at extreme conditions, Materials Research Lecture, California Institute of Technology (Pasadena, CA, October 1, 2014). 2023. Schilling, J. S., Contrasting effects of extreme pressure on highly correlated electron behavior (invited), International Workshop on Pressure and Strain Effects in Correlated Electron Materials (Dresden, Germany, October 6-10, 2014). 2022. Ali, S. J., R. Smith, D. Erskine, J. Eggert, P. Celliers, G. W. Collins, and R. Jeanloz, Two-dimensional imaging velocimetry of heterogeneous flow and brittle failure in diamond, Eos Trans. AGU Fall Meet., Suppl. 95 (2014). 2021. Benitez-Perez, J. M., J. Gomez Barreiro, H. R. Wenk, S. Vogel, Y. Soda, M. Voltolini, and J. Martinez-Catalan, Quantitative texture analysis of talc in mantle hydrated mylonites, Eos Trans. AGU Fall Meet., Suppl. 95 (2014). 2020. Bennett, N. and Y. Fei, Element redistribution in Fe-Ni-O alloys by a thermal gradient: Implications for siderophile element partitioning during core formation and crystallization, Eos Trans. AGU Fall Meet., Suppl. 95 (2014). 2019. Bian, H., Z. mao, J. F. Lin, J. Yang, J. Liu, H. Watson, H. Chen, J. Shim, V. Prakapenka, Y. Xiao, and P. Chow, (Fe,Al)-bearing post-perovskite in the Earth's lower mantle, Eos Trans. AGU Fall Meet., Suppl. 95 (2014). 2018. Chen, H., S. H. Shim, K. Leinenweber, Y. Meng, and V. Prakapenka, Crystal structure of calcium silicate perovskite synthesized under water saturated conditions at mantle related pressure-temperature, Eos Trans. AGU Fall Meet., Suppl. 95 (2014). 2017. Clark, A., C. Lesher, S. Jacobsen, T. Yu, and Y. Wang, Volumetric and elastic properties of basalt at high pressure by x-ray microtomography and GHz-ultrasonic interferometry, Eos Trans. AGU Fall Meet., Suppl. 95 (2014). 2016. Collins, G. W., et al., Exotic behavior of matter in the deep interiors of exoplanets, Eos Trans. AGU Fall Meet., Suppl. 95 (2014). 2015. Cottaar, S., M. Li, A. McNamara, B. Romanowicz, and H. R. Wenk, The role of post-perovskite in explaining observations of seismic anisotropy (Invited), Eos Trans. AGU Fall Meet., Suppl. 95 (2014). 2014. Diamond, M., S. J. Ali, J. Eggert, R. Jeanloz, G. W. Collins, and R. McWilliams, Investigating metallization in shock-compressed alkali halides, Eos Trans. AGU Fall Meet., Suppl. 95 (2014). 2013. Fei, Y., L. Han, N. Bennett, M. Hou, Y. Kuwayama, and H. Huang, Multiple experimental efforts to understand the structure and dynamics of Earth's core (Invited), Eos Trans. AGU Fall Meet., Suppl. 95 (2014). 2012. Finkelstein, G., P. Dera, and T. Duffy, High-pressure phase of cordierite from single-crystal x-ray diffraction to 15 GPa, Eos Trans. AGU Fall Meet., Suppl. 95 (2014). 2011. Geballe, Z., A. Townley, and R. Jeanloz, How to measure heat capacity of metals at 10s to 100s of GPa, Eos Trans. AGU Fall Meet., Suppl. 95 (2014). 2010. Godwal, B., F. Gonzalez-Cataldo, and R. Jeanloz, Siulating ramp compression of diamond, Eos Trans. AGU Fall Meet., Suppl. 95 (2014). 2009. Gomez Barreiro, J., M. Voltolini, J. Martinez-Catalan, J. M. Benitez-Perez, R. Diez-Fernandez, H. R. Wenk, S. Vogel, and L. Mancini-Elettra, Quantitative fabric analysis of eclogite facies mylonites: texture and microtomography, Eos Trans. AGU Fall Meet., Suppl. 95 (2014). 2008. Han, L., Y. Fei, and L. Zhang, Behavior of K in eclogite from subducted slab at pressures from 4 to 10 GPa, Eos Trans. AGU Fall Meet., Suppl. 95 (2014). 2007. Hummer, D., A. Kavner, C. Manning, C. Park, Y. Kono, and C. Kenney-Benson, Viscosity of carbonate-silicate melts using ultra-high resolution falling sphere viscometry, Eos Trans. AGU Fall Meet., Suppl. 95 (2014). 2006. Jackson, J., A. Wolf, J. Wicks, N. Solomatova, D. Bower, D. Dun, W. Sturhahn, P. Dera, and V. Prakapenka, Sound velocities and equations of state for lower mantle phases: Implications for deep mantle structures (Invited), Eos Trans. AGU Fall Meet., Suppl. 95 (2014). 2005. Jeanloz, R. and M. Ishii, Seismological constraints on lower-mantle convection, Eos Trans. AGU Fall Meet., Suppl. 95 (2014). 2004. Kavner, A. and M. Armentrout, High-pressure, high-temperature equations of state for Fe, Ni, andCo silicates, oxides, and metals: Constructing a deep earth electrochemical series, Eos Trans. AGU Fall Meet., Suppl. 95 (2014). 2003. Lavina, B. and Y. Meng, Complexity of high-pressure orthorhombic iron oxides, the characterization of Fe5O6, Eos Trans. AGU Fall Meet., Suppl. 95 (2014). 2002. Lazarz, J., S. M. Thomas, S. Tkachev, J. Townsend, C. Bina, and S. Jacobsen, High P-T elastic properties of OH-bearing majoritic garnet, Eos Trans. AGU Fall Meet., Suppl. 95 (2014). 2001. Liu, H., Y. Fei, L. Han, Y. Kono, M. Hou, Z. Zhao, and J. Du, Viscosity measurements of eclogite melt up to 5.6 GPa and 2000 K, Eos Trans. AGU Fall Meet., Suppl. 95 (2014). 2000. Liu, J., J. Li, and D. Ikuta, "Invar"-like behavior in compressed Fe7C3 with implication for deep carbon cycle, Eos Trans. AGU Fall Meet., Suppl. 95 (2014). 1999. Mao, W., Y. Lin, Y. Liu, C. Shi, and W. Yang, 3D spectroscopic x-ray imaging with nanoscale resolution at extreme conditions (Invited), Eos Trans. AGU Fall Meet., Suppl. 95 (2014). 1998. Marquardt, H., L. Miyagi, S. Speziale, H. P. Liermann, S. Merkel, and C. Tomé, Deformation of (Mg,Fe)O ferropericlase to temperatures of 1150 K and pressures of 96 GPa: Implications for mantle flow and seismic anisotropy (Invited), Eos Trans. AGU Fall Meet., Suppl. 95 (2014). 1997. Miller, R., J. Jackson, W. Sturhahn, J. Zhao, and C. Murphy, Sound velocities of iron-nickel and iron-nickel-silicon alloys at high pressure, Eos Trans. AGU Fall Meet., Suppl. 95 (2014). 1996. Millot, M., S. Hammel, J. Rygg, R. Jeanloz, and G. W. Collins, Optical properties of superionic water at 2 Mbar, Eos Trans. AGU Fall Meet., Suppl. 95 (2014). 1995. Miyagi, L. and M. Jugle, Deformation and transformation textures in the NaMgF3 perovskite -> post-perovskite system, Eos Trans. AGU Fall Meet., Suppl. 95 (2014). 1994. Nisr, C., S. H. Shim, K. Leinenweber, R. Hervig, V. Prakapenka, and Y. Meng, Water in Al-free stishovite up to 65 GPa and 200 K, Eos Trans. AGU Fall Meet., Suppl. 95 (2014). 1993. Palaich, S., C. Tulk, J. Molaison, A. Makhluf, M. Guthrie, A. Kavner, and C. Manning, Structure and thermal behavior of CO2-IV at 18 GPa from 300-625 K, Eos Trans. AGU Fall Meet., Suppl. 95 (2014). 1992. Rainey, E., C. Bennett, and A. Kavner, Thermal conductivity of lower mantle minerals and heat flux across the core-mantle boundary, Eos Trans. AGU Fall Meet., Suppl. 95 (2014). 1991. Schmandt, B., S. Jacobsen, T. Becker, Z. Liu, and K. Dueker, Dehydration melting in the top of the lower mantle (Invited), Eos Trans. AGU Fall Meet., Suppl. 95 (2014). 1990. Shibazaki, Y., Y. Kono, Y. Fei, and G. Shen, Structure measurement of liquid Fe-C alloys at high pressure, Eos Trans. AGU Fall Meet., Suppl. 95 (2014). 1989. Sinogeikin, S., J. Smith, C. Lin, L. Bai, E. Rod, and G. Shen, Elasticity and anelasticity of materials from time-resolved x-ray diffraction, Eos Trans. AGU Fall Meet., Suppl. 95 (2014). 1988. Smart, T., M. Diamond, E. O'Bannon, J. Yuan, S. Stackhouse, B. Godwal, R. Jeanloz, and Q. Williams, PbCl2 and SnCl2 at high-pressures as analogs for SiO2 metallization, Eos Trans. AGU Fall Meet., Suppl. 95 (2014). 1987. Stagno, V., K. Crispin, A. Shahar, and Y. Fei, Growht kinetics of a reaction rim between iron and graphite/diamond and the carbon diffusion mechanism at high pressure and temperature, Eos Trans. AGU Fall Meet., Suppl. 95 (2014). 1986. Thomas, S. M., S. Jacobsen, C. Bina, P. Reichart, M. Moser, G. Dollinger, and E. Hauri, Water in olivine and its high-pressure polymorphs, Eos Trans. AGU Fall Meet., Suppl. 95 (2014). 1985. Tsuchiya, J., J. Townsend, T. Tsuchiya, S. Jacobsen, and C. Bina, First principles investigations of hydrous phases at the bottom of the lower mantle (Invited), Eos Trans. AGU Fall Meet., Suppl. 95 (2014). 1984. Wang, Y., T. Yu, C. Prescher, V. Prakapenka, P. Eng, J. Stubbs, Y. Kono, and G. Shen, A Paris-Edinburgh cell for liquid silicate structural studies using monochromatic diffraction and soller slits, Eos Trans. AGU Fall Meet., Suppl. 95 (2014). 1983. Waszek, L., K. Arredondo, G. Finkelstein, L. Kellogg, L. Vadran, M. Li, C. Lithgow-Bertelloni, B. Romanowicz, N. Schmerr, M. Rudolph, J. Townsend, Z. Xing, and F. Yang, Slab stagnation in the lower mantle: A multidisciplinary investigation, Eos Trans. AGU Fall Meet., Suppl. 95 (2014). 1982. Wu, X., J. F. Lin, J. Liu, Z. Mao, X. Guo, C. McCammon, Y. Xiao, and V. Prakapenka, Elasticity of single-crystal phase D across the spin transitions of ferrous and feric iron in the lower mantle, Eos Trans. AGU Fall Meet., Suppl. 95 (2014). 1981. Wu, Y., X. Wu, J. F. Lin, T. Yoshino, C. McCammon, Y. Xiao, and V. Prakapenka, Electronic spin and valence states of iron in the Al-rich NAL and CF phases in the subducted slabs, Eos Trans. AGU Fall Meet., Suppl. 95 (2014). 1980. Ye, Y., C. Gu, S. H. Shim, V. Prakapenka, and Y. Meng, In situ measurements of the post-spinel and post-garnet phase boundaries in pyrolite at 17-32 GPa and 1500-2400 K, Eos Trans. AGU Fall Meet., Suppl. 95 (2014). 1979. Yu, T., C. Prescher, J. Wang, V. Prakapenka, P. Eng, Y. Kono, J. Stubbs, and G. Shen, Structure study of sodium disilicate glass in a Paris-Edinburgh cell using monochromatic x-ray diffraction and a multi-channel collimator, Eos Trans. AGU Fall Meet., Suppl. 95 (2014). 1978. Zepeda-Alarcon, E., R. Lebensohn, P. Kaercher, and H. R. Wenk, Viscoplastic modeling of MgSiO3 perovskite and periclase aggregates, Eos Trans. AGU Fall Meet., Suppl. 95 (2014). 1977. Zhang, L., Y. Meng, D. Popov, J. Wang, and H. K. Mao, Application of multigrain crystallography to mineralogy of the deep Earth, Eos Trans. AGU Fall Meet., Suppl. 95 (2014). 1976. Zhang, L., Y. Meng, W. Yang, L. Wang, W. Mao, Q. Zeng, J. S. Jeong, A. J. Wagner, K. A. Mkhoyan, W. Liu, R. Xu, and H. K. Mao, Disproportionation of (Mg,Fe)SiO3 perovskite and its implications to the deep earth (Invited), Eos Trans. AGU Fall Meet., Suppl. 95 (2014). 1975. Hemley, R. J., New views of structure and bonding in extreme environments (invited), University of Nebraska-Lincoln Chemistry Colloquium (Lincoln NE, November 14, 2014). 1974. Hemley, R. J., New views of structure and bonding in extreme environments (invited), Callifornia Institute of Technology (Pasadena, CA, February 25, 2014). 1973. Hemley, R. J., New views of structure and bonding in extreme environments (invited), Pimentel Lecture (University of California - Berkeley, Berkeley, CA, November 18, 2014). 1972. Hemley, R. J., New views of structure and bonding in extreme environments (invited), Foster Colloquium (University at Buffalo, State University of New York, October 24, 2014). 1971. Lee, K. K. M., Sinking deep in to a C-rich planet: Using experiments to constrain planetary interiors, YCAA Seminar, Yale University (New Haven, CT, February 18, 2014). 1970. Mauger, L., M. S. Lucas, J. A. Munoz, S. J. Tracy, and B. Fultz, Anharmonic phonon entropy in alpha-Fe at elevated temperatures, TMS 2014 Hume-Rothery Award Symposium: Thermodynamics and Kenetics of Materials (San Diego, CA, February 18, 2014). 1969. Cahill, D. G., Extremes of heat conduction in molecular materials (invited), Department of Chemical Engineering Seminar, Illinois Institute of Technology (Chicago, IL, February 19, 2014). 1968. Cahill, D. G., Extremes of heat conduction in molecular materials (invited), International Thermal Conductivity Conference, Purdue University (West Lafayette, IN, April 28-30, 2014). 1967. Shelton, H., P. Dera, M. C. Barkley, and R. T. Downs, Phase transition and hydrogen bonding behavior in Be(OH)2, Zn(OH)2, and SiO2 cristobalite at high temperatures and pressures, COMPRES Annual Meeting (Skamania Lodge, WA, June 16-19, 2014). 1966. Hu, Y., P. Dera, R. T. Downs, K. Zhuravlev, R. T. Downs, and Q. Williams, New high-pressure orthorhombic Imma Ca-Fe silicate perovskite with hedenbergite composition, COMPRES Annual Meeting (Skamania Lodge, WA, June 16-19, 2014). 1965. Yoo, C. S., Barochemistry in highly compressed solids (invited), Chemistry Department, University of North Dakota (Grand Forks, ND, February 28, 2014). 1964. Zurek, E., Structure prediction from first principles (invited), The Minerals, Metals and Materials Society Annual Meeting (San Diego, CA, February, 2014). 1963. Shamp, A., Boron carbide: The evolution of structure under pressure, Carbides, Nitrides, and Related Materials in Earth, Planetary, and Materials Science (Davis, CA, May, 2014). 1962. Dlott, D. D., Vibrational energy transfer on surfaces and in liquids, MIT Modern Optics and Spectroscopy Seminar (Cambridge, MA, April, 2014). 1961. Dlott, D. D., Probing shocked microstructured energetic materialss, AFOSR Dynamic Interfaces Workshop (Arlington, VA, March 2014). 1960. Dlott, D. D., Probing dynamic materials interfaces using nonlinear coherent vibrational spectroscopy, AFOSR Dynamic Interfaces Workshop (Arlington, VA, March 2014). 1959. Dlott, D. D., SFG studies of buried electrochemical interfaces (invited), American Chemical Society National Meeting (Dallas, TX, March, 2014). 1958. Bishop, M., High pressure-temperature phase diagram of 1,1-diamino-2,2-dinitroethylene (FOX-7), Stewardship Science Academic Programs Symposium (North Bethesda, MD, February 19-20, 2014). 1957. Borstad, G., Mixtures of D2-H2O, D2-NH3 and D2-CH4 under high pressure, Stewardship Science Academic Programs Symposium (North Bethesda, MD, February 19-20, 2014). 1956. Chang, Y. Y., Hardness and elastic properties of boron-doped diamond, Stewardship Science Academic Programs Symposium (North Bethesda, MD, February 19-20, 2014). 1955. Daviau, K., Preliminary work on the melting of SiC at high pressure, Stewardship Science Academic Programs Symposium (North Bethesda, MD, February 19-20, 2014). 1954. Geballe, Z., Brillouin studies of a highly-stable glass, CaSiO3, from 0 to 44 GPa, Stewardship Science Academic Programs Symposium (North Bethesda, MD, February 19-20, 2014). 1953. Hohensee, G., Metal-diamond interface thermal conductance with nitrogen defects at high pressures by time-domain thermoreflectance, Stewardship Science Academic Programs Symposium (North Bethesda, MD, February 19-20, 2014). 1952. Jugle, M., Deformation and transformation textures in the NaMgF3 perovskite to post-perovskite system, Stewardship Science Academic Programs Symposium (North Bethesda, MD, February 19-20, 2014). 1951. Kaercher, P., Understanding lower mantle rheology from two-phase deformation experiments, Stewardship Science Academic Programs Symposium (North Bethesda, MD, February 19-20, 2014). 1950. 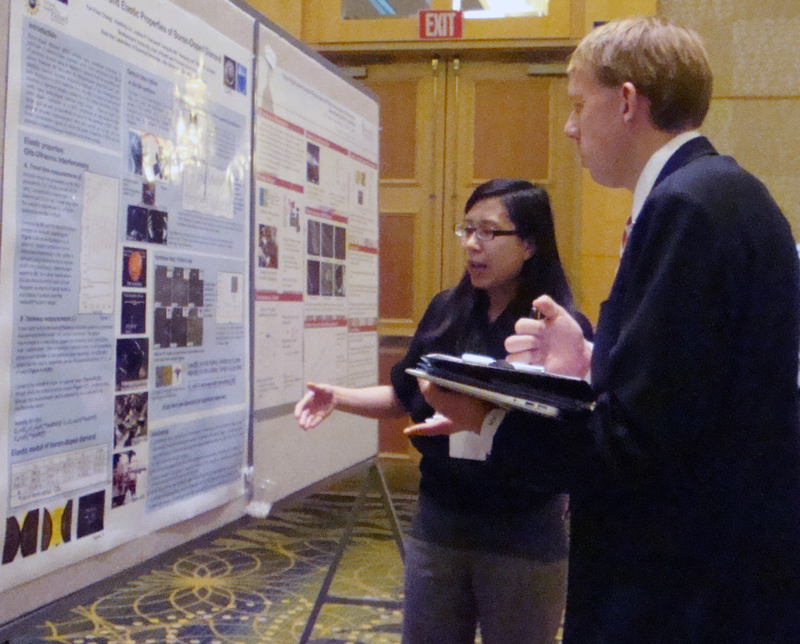 Lim, J., Origin of pressure-induced volume collapse in Dy, Tb, Gd, and destruction of dense kondo state in CeBa, to 120 GPa, Stewardship Science Academic Programs Symposium (North Bethesda, MD, February 19-20, 2014). 1949. Murialdo, M., A thermodynamic study of high pressure physisorption on nanostructured carbon, Stewardship Science Academic Programs Symposium (North Bethesda, MD, February 19-20, 2014). 1948. Rainey, E., High-pressure thermal conductivity of (Mg,Fe)SiO3 perovskite measured in the laser-heated diamond anvil cell, Stewardship Science Academic Programs Symposium (North Bethesda, MD, February 19-20, 2014). 1947. Shamp, A., Boron carbide: The evolution of structure under pressure, Stewardship Science Academic Programs Symposium (North Bethesda, MD, February 19-20, 2014). 1946. Shaw, W., Laser-driven flyer-plates for shock induced chemistry, Stewardship Science Academic Programs Symposium (North Bethesda, MD, February 19-20, 2014). 1945. Shen, G., HPCAT facility at the Advanced Photon Source: Exploring matter under extreme conditions, Stewardship Science Academic Programs Symposium (North Bethesda, MD, February 19-20, 2014). 1944. Smith, S., Polymorphism in paracetamol: Evidence of additional forms IV and V at high pressure, Stewardship Science Academic Programs Symposium (North Bethesda, MD, February 19-20, 2014). 1943. Tomasino, D., Dynamic thermo-mechanical loading of simple molecular systems, Stewardship Science Academic Programs Symposium (North Bethesda, MD, February 19-20, 2014). 1942. Uhoya, W., High pressure effects on the superconductivity in rare earth doped CaFe2As2, Stewardship Science Academic Programs Symposium (North Bethesda, MD, February 19-20, 2014). 1941. Zepeda-Alarcon, E., High pressure deformation of two-phase mineral assemblages: Lower mantle implications, Stewardship Science Academic Programs Symposium (North Bethesda, MD, February 19-20, 2014).